Yuri Tarasov was born on July 4, 1929 in Kamenka village of the Moscow region. The creative development of Yuri in painting was long and diverse. He spent his childhood and began to study painting seriously in a former Morozov’s estate by the Rozhaika River near Moscow in 1945, when he was 16 years old. His first sketches, created in 1948 in the small Tatar village of Kozy (Eastern Crimea), a village ravaged by the Soviet grip, initiated a process of deep and professional training in painting. Later he continued this training in the studio of the remarkable person and pedagogue Mikhail Ivanovich Kurilko at Surikov Arts Institute. Suzdal, work in Moscow theaters, Novorossijsk, trips to the North, Ural, Central Asia, travels by the Volga river, life in Moscow in a shared apartment by the Patriarchy Ponds and life in the dying Russian country, folks and books — all of this led to the creation of paintings with full liberation, regardless of the reflection of the moment. Although Yuri Tarasov began to exhibit his paintings in 1957 and joined the allied Painters Association in 1960, he often was out of place in stagnant former-Soviet society. His avant-garde pictures of the sixties and the early seventies were not exhibited, nor was his large canvas named “Levitan” (the time of its creation coincided with the first wave of Jewish emigration), his picture “Apartment № 11” (dedicated to the famous novel by Mikhail Bulgakov), or the portraits of his relatives and friends. Some of these pictures were rejected right away; others were accepted by authorities and shown in All-Union catalogues, but “forgotten” in the basements of Moscow Manege (Art Gallery). These events did not influence the artist – he was engaged in new projects. Since the end of the seventies Yuri Tarasov had been painting still lives with Russian domestic items: samovars, pancakes, pirogy, Kuznetsovky china and burning candles; they are very popular and have spread all over the world. At the same time he began to paint his “Alupka” and “Eastern Crimea” series, resulting in portraits of Marina Tsvetaeva and Maksimilian Voloshin. His series “The Winters of Central Asia” were also created at this time. The memoirs of Nadezhda Mandelshtam had a great influence on the artist. He went back to the ancient town of Cherdyn in Ural and opened an exhibition at the city museum, which was dedicated to Cherdyn’s history in the tragic ‘30s and a tragedy of Russian poet Osip Mandelshtam. Yuri Tarasov donated his painting “Mandelshtam in Cherdyn” to Cherdyn’s Museum. As an artist Yuri Tarasov was one of the strongest painters in the Soviet Union and later Lithuania. He is listed in most catalogues and publications of Soviet and Russian artists. “United Artists Rating”, Russia’s largest and most popular artists’ index, rates Yuri as a “fully developed professional artist demanded by the art market”. His talent had no borders, while professionalism and a creative approach were second nature to him. As the son of the Head of the Supreme Council of the Russian Federation Yuri had the opportunity to become one of the best-know artists in the Soviet Union, but he never wanted fame or money, strongly believing that great art must bring recognition and not the other way around. Ignoring the opportunities the PR life gave him, committed only to his art and his family, Yuri Tarasov became one of the top artists not only in Moscow but in the entire USSR. The recognition that he so carefully avoided inevitably came to him after each exhibition where his art was included. Yuri’s fantastic vision and ability to show the true Russian classical art school with a touch of modern European trends made his paintings highly controversial in Soviet society. On the one hand this created obstacles in his art path, and on the other it brought him that dreaded fame. After the fall of the Soviet Union Yuri moved to Vilnius and began his career and art life all over again. In Vilnius he created many new artworks that traveled all over Europe and the world, winning wide fame and recognition for their beauty and professionalism. These artworks are now in the DMT collection to continue the legacy of this great artist. 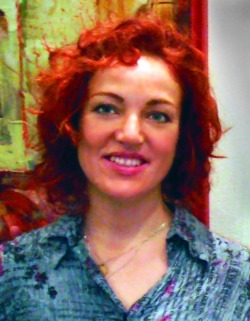 Tatiana was born on September 9, 1977 in Moscow and since 1993 has been living in Vilnius. She graduated from high art college in Moscow, but studied systematic painting under the guidance of her father, artist Yuri Tarasov. Most of her childhood was spent outdoors and in journeys all over the country. The sketches and drawings in her portfolio at her graduation from Moscow Art College in 1989 had been made in Middle Asia and Kolsky peninsula, Odessa and Mogiliov-Podolsky, Alupka and Koktebel, Cherdyn and Solikamsk, St. Petersburg, Chuvashia, Penza and Nijegorodsk regions, and of course in Moscow. In art college Tatiana thoroughly learned Russian folk arts and crafts; however, the techniques of still life, portrait and landscape she learned from Jurij Tarasov. Professional activity for Tatiana started in her adolescence, when her first exhibitions in Vilnius, Klaipeda, Kaunas, and Visaginas took place. As an external student she studied old Slavonic and Modern Greek in Vilnius University and for a few years was a summer student in Jewish culture and Yiddish language, which became an unlimited source of creative work for her. She also worked as a draftsman in archaeological research expeditions. Poetry and songwriting are integral parts of this artist’s creative world. She is a prize-winner of the poetry contest dedicated to the 200th anniversary of Russian philology in Vilnius. In 2004 she recorded the disk “Ishod zimy” (The End of Winter), where she presented her 25 songs. Soon she started to perform in the Moscow Bard Café “Gnezdo Gluharya”. In 2004 she also made her debut as a performer of Yiddish songs and Russian romances; part of that repertoire is presented in the disk “Dymok ot papirosy” (The Smoke of a Cigarette, 2005). She earned the diploma of the International Contest of Amateur Performers of Russian Folk Songs and Romances (Volgograd, 2004) and became the laureate of the contest “Den otkrytyh dverey” of the radio “Shanson” (Moscow, 2006). Tatiana’s poetry was published by a Lithuanian press; her songs were on the air of Lithuanian radio and TV stations. There were a number of publications, TV and radio programs about her work, an interview with the Russian editorial office of “Voice of America”, and a topic dedicated to Tatiana on the series European stories on the Radio “Liberty“. Her paintings are in many private collections of famous Russian and Lithuanian film directors, singers, writers, and actors in Lithuania and abroad. Personal exhibition at the Vilnius Palace of Science and Technique. The exhibition, dedicated to 15-th anniversary of the Russian Gallery:” Maximilian Voloshin‘s Kocktebel” (Yuri Tarasov - paintings, Tatiana Tarasova – graphic art). International exhibition “The Man and The Wheel” at the exhibition complex of the National Library of Belorussia. A Lithuanian painter of Polish descent, Cheslov Grigonis was born in Aukshtadvaris, Ustroyany (Lithuania) in 1951. During the Soviet era he completed Čiurlionis art school in Vilnius and graduated from university as an architect. Now retired, he devotes himself to his art, working with oil, acrylic and pastel techniques. He excels in creating vibrant and interesting color combinations in the impressionist manner, often portraying the architecture of Vilnius. All who have seen his artworks are compelled by the beautifully mysterious worlds that he creates. Without questioning it, many would state that Cheslov represents the Lithuanian ethnic art style, adding to it his own distinctive architect’s personality. During exhibitions where a number of artists display their work alongside Cheslov’s, many visitors stop to spend more time next to his artworks than others, looking with an intense gaze as if they had entered into the painted world. Cheslov’s ability to capture the true essence of Vilnius, its coziness, mystery, gloominess and antiquity, then add to the canvas a touch of real and surreal life, makes his art truly magnificent. What attracts viewers the most may be the colors that he chooses to paint with. Using shades that are murky, gloomy and dim he is nevertheless able to create paintings that are very alive, in their own unique way. Architecture demands precision, though interestingly enough his works are totally opposite from that, showing complete freedom from borders without a single straight-looking line, and who can depict that better than an architect himself! Cheslov’s art is known and exhibited all over Lithuania, although he mainly works in Vilnius. Internationally, Cheslov’s paintings are in many private European, American and Asian collections. Cheslov has an interesting personality trait that makes him a rare artist nowadays. He paints only what he likes and enjoys. While not a rich man, he has everything that he needs to live a decent life, so while many artists work to earn a living he paints because he enjoys art. Sale of Cheslov’s paintings is a byproduct of his work. He very rarely accepts any orders for paintings and has countless times turned down a good profitable order, choosing instead his personal art interests. This makes Cheslov Grigonis a unique artist who represents the true direction of Lithuanian art today. 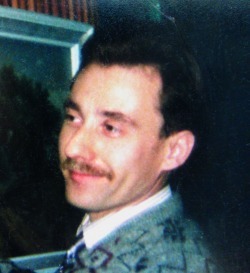 Yuri was born on January 3, 1962 in Kustanai, Kazakhstan. He received his education from Izmail art school (Ukraine), Mahachkala art college (Dagestan), and National Cinematography Institute of Russia (VGIK), graduating from the art faculty. He speaks Lithuanian, English, Ukrainian and Russian. Yuri lives and works in Vilnius. A member of the Lithuanian Cinematography Union, Yuri worked as an art director in the movie industry. The films “Freedom” and “Ghetto” were honored with the Lithuanian national cinema award “Best playing movie of the year”; in 2006 his work in the movies “Black Death” and “Leonardo da Vinci” was nominated for an “Emmy” award. Since 1980 Yuri’s work has been featured in many group and personal exhibitions in several countries. He has worked for the theatre, and continued his movie work with cinematography in more than a dozen films. Yuri’s artworks are in private collections in Lithuania, Ukraine, Russia, Canada, Germany, USA, France, United Kingdom, Sweden, Finland, Holland, Morocco, Belarus, Poland, Denmark and other countries. Yuri is one of the most talented and sought-after professional artists in Lithuania. He perfectly uses all the styles in his possession to create flawless, high-quality artworks. Through his brushstrokes, colors, and the thoughts and ideas that together play out on canvas, Yuri’s artworks generate immense energy that is rarely matched. Behind each perfectly painted artwork is a great talent that, although it comes naturally, is always pushed to the limit in order for that artwork to be the best it can be. In each painting Yuri goes far beyond the depicted image, portraying a deeper meaning of existence where each color tells the tale of how, when and for what reason that painting came to life. Group exhibitions: 1980 art exhibition in Mahachkala, Dagestan; 1982 art exhibition in Ishmael, Ukraine; 1986 and 1988 art exhibition at Cinema House, Moscow, Russia; 1995 art exhibition in Toronto, Canada; 1996 art exhibition at “Arka” Gallery, Vilnius, Lithuania; 1996 art exhibition at Design Museum, London, United Kingdom; 1997- 2000 art exhibitions at “Russian Art Gallery” Vilnius, Lithuania; 2000 International Plein Air “Shatkovo 2000”, Poland; 2003 art exhibition of historical portraits “Iron wolf”, Vilnius, Lithuania; 2005 art exhibition at “Romanov Gallery” Vancouver, Canada; 2005 International Plein Air “Fall” Ilawa, Poland. Personal exhibitions: 1993 Bank “Nida”; 1994 art exhibition at “Russian Art Gallery”; 1995 art exhibition at Russian Drama theater; 2000 art exhibition “Prikosnovenie”, 2001 art exhibition “Otrazhenie” at “Russian Art Gallery”; 2001 art exhibition in Lithuanian Bank; 2003 art exhibition at Russian Drama theater; 2004 art exhibition “ Morocco motives” (Stones, sand, stones), French cultural center; 2004 art exhibition at Russian Drama theater; all in Vilnius, Lithuania. 2004 art exhibition at Russian Cultural center, Daugavpils, Latvia. Theater plays: 2004 “#13” theater play, directed by E. Murashov, Russian drama theater, Lithunia, Vilnius. Cinematography: 1987 “TROPINKA” director M. Kozirev produced by Gorkiy studio, Moscow; 1988 “Quentin Dorvard” director S. Tarasov, produced byMosfilm, Moscow; 1991 “Marius-1”, director Y. Pakulis, M. Gedris, produced by Lithuania cinema studio, Lithuania-Russia; 1991 “Three Days” directed by S. Bartas, Lithuaina; 1991 “FORTE OR OČ 12/36” directed by Y. Martsinkyavichus, Lithuania; 1997 “House” directed by S. Bartas produced by Kinema, Lithuania-France-Portugal; 1998 “Odyssey” animation directed by V. Ashkinis produced by Vilanima (Lithuania) and Poseidon Film, distributed by BBC; 1999 “Courtyard” director V. Navasaitis, Lithuania-Fance; 2000 “Freedom” directed by S. Bartas, produced by Kinema, Lithuania-France-Morocco-Portugal; 2002 “The Last Wagon” directed by A. Stonis, Lithuania; 2004 “Role” directed by G. Szhichkute, Lithuania; 2004 “Black Death”, “Leonardo da Vinci” directed by R. Gardner, produced by Lithuanian cinema and Gardner Films (Canada); 2005 “Barbarians”, “Spain” directed by R. Gardner, produced by Lithuanian cinema and Gardner Films (Canada); 2006 “Vilnius Ghetto” directed by A. Uzenas, produced by Lithuania-Germany; 2006 “Children from Heaven” by “Studija JU”, Lithuania; 2006 “Perl” directed by L. Kairis “Studija 2000” Lithuania. Stanislaw was born in 1960 in the small village of Parudamina, located in the Vilnius region. He grew up without parents, with his grandfather who was an artist himself. It was his grandfather who got Stanislaw interested in art and gave him the basics in painting. In 1978 he graduated from the Vilnius school of arts. He served in the Soviet Army in logistical support forces. Stanislaw is a member of the European Painters Association and Polish Painters Union. As an artist, Stanislaw developed the individual painting and graphic style in which most of his artworks are done. Today he works and lives in Vilnius city although he travels extensively to Poland and the United Kingdom to work, sell and exhibit his art. Stanislaw is probably one of the most well known and exhibited modern Lithuanian-Polish painters in Lithuania and abroad. His fame comes from his unique style and his combination of different techniques in one artwork, creating astonishing perspective, depth and three-dimensional views. All this is in addition to the very original and imaginative subjects around which Stanislaw creates his art. Always thinking, constantly searching for something new, Stanislaw combines fantastic images with his unique style, gaining a reputation as a rare and talented painter. Stanislaw’s artworks are in the possession of many Lithuanian celebrities, famous businessman and well-known collectors. Many of his paintings are located in central Europe, especially in London, England. Tourists and collectors regularly travel to Vilnius or visit his exhibitions abroad to expand their collections. Since the 1990s Stanislaw has had a number of personal exhibitions: 1996 Znad Wilii Gallery, Vilnius; 1998 City Sapeginiki Gallery, Poland; 1999 Mon-Mart Gallery, Lublin, Poland; “Pultusk 2001” Warsaw, Poland; 2002 Dom Polonii Gallery, Warsaw, Poland; 2004 Art Gallery, Paris; 2006 Bergen, Scandinavia; 2008 Exhibition in UK Artists Association, which Stanislaw is preparing to join. Stylistically speaking, Stanislaw creates romantic paintings with clear impressionist techniques; occasionally, on the basis of romanticism, he combines impressionism and realism together. With the techniques of impressionists he creates rough-painted first perspectives, and as the view distances to the horizon the image becomes more fine and detailed. As the last perspective becomes completed in the manner of realism the painting gains that distinctive three-dimensional aspect. Application of oil paint in very thick layers over the entire painting or in the first perspective creates an inimitable pattern that makes each of Stanislaw’s paintings the only one in the world, even if the image is reproduced by the artist himself. As a well-rounded artist Stanislaw doesn’t have a standard frame size for his paintings; he makes artworks in all shapes and sizes on canvas that is large or small, choosing the painting’s dimensions to suit the thoughts in his mind. “…Born in Vilnius on April 24,1963. 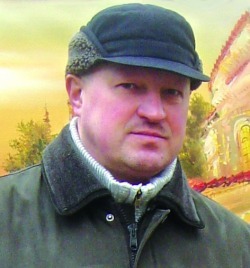 Lives and works in Vilnius city as a professional artist. Since 1996 member of ULFA (Union of the Lithuanian Folk Artist) which itself in 1987 became a member of UNESCO Folk Art Organization. Participated at regional and national exhibitions in Poland from 1992 to 1994. 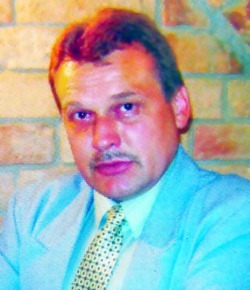 Held personal exhibitions in Vilnius between 1999 and 2000. 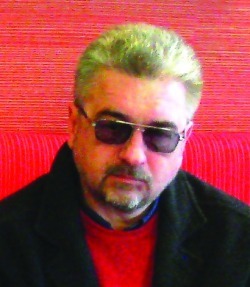 Sergey’s works can be found in private collections of Lithuania and other countries. Has number of notations in the national press…” – from the book “National Folk Art Creations ULFA Vilnius 2001”. Since 2002 Sergey has progressed extensively, becoming one of the most sought-after artists in the art center of Vilnius city. His paintings can be found in many private collections, not only in Lithuania and Europe but all over the world. In his cityscape paintings of Old Vilnius Sergey is able, through his selection of color, to portray elements of contentment and rich comfort of this city that so many newcomers notice while long-time residents have forgotten. Painting in the impressionist and romantic manner Sergey uses very rich colors – from cherry red mixed with dark brown to yellow and black – in order to show the beauty of Vilnius at night or dusk. When showing Vilnius in the winter, soft red, yellow and white dominate the painting, portraying the city living a slow leisurely life. After viewing a number of Sergey’s artworks you find that almost on every painting sometimes a little, sometimes the whole canvas, is covered by colors and shades of brown with cherry red. It is the color of pottery and red brick that most of Old Vilnius is built with. Sergey paints this essence of Vilnius because it is in his heart. As a result, each of his paintings opens the true heart of this city to everyone. Born on December 15, 1955 in Klaipeda, Lithuania’s sea port and number-one summer destination resort, Robert worked in various fields until the age of 25. In 1980 he discovered a talent and desire to paint and decided to dedicate himself to the art. Today Robert still lives in Klaipeda and is working as an artist. He is a member of a national master-craftsmen society, “ZEMAITIJA – ZHEMAITIYA”. Robert’s art constantly participates in exhibitions all over Klaipeda and Lithuania. His art is sold at galleries nationwide. Since Klaipeda and Curonian Spit were ranked by British Sunday Times as No. 9 of the top 100 destinations to visit, Robert’s art after the fall of the Soviet Union has traveled to all corners of the world. Although nature is very special to Robert he is not limited to it. Robert enjoys painting people and faces; his cityscape of Klaipeda’s downtown captures the beauty of that ancient city. Occasionally Robert ventures into abstract art. He paints all his art in a classical impressionists’ manner similar to Claude Monet, although his personal signature is present in every brushstroke. Alexander was born on January 6, 1969 in the village of Vievis, near Vilnius city. In 1979 he went to Čiurlionis art school in Vilnius, completing it in 1981 with specialization as an artist. At present Alexander still lives and works in the small place of his birth, Vievis village, although most of his art is sold in Vilnius. At home, surrounded by the nature he grew up with, Alexander paints rural Lithuanian landscape as it is, wild, beautiful, sometimes cultivated, with every painting showing an authentic image of the land. Alexander is one of the last true nature-loving realists in Lithuania, painting everything to the very last detail in order to show the real colors of the Baltic countryside. He enjoys everything natural and authentic, so when asked what he does in his spare time he answers folk-art. Alexander has participated in a number of exhibitions all over Lithuania, with the majority of them in Vilnius. He has often been published in local and national newspapers. His art is widely purchased by collectors from many European and other countries. There are many regular tourists in Vilnius who come specifically for Alexander’s artworks. Apart from his own unique brushstrokes and incredible ability to capture those small details, all Alexander’s paintings are different from other Lithuanian realist artists’ by their thematic use of colors. Intentionally or not, many realist artists intensify the colors of nature as if to show it in the best possible light. Alexander, on the other hand, is naturally able to perceive and recreate with oil on canvas the true colors of nature with no exaggeration whatsoever. His abilities for details are not limited to any particular painting size; since most of his works are done on a 60cm x 90cm canvas he is fully able to create large artworks with fine precision. This admirable skill is unfortunately becoming uncommon in modern-day artists. Alexander surprised everyone with his talent when he created his first flower paintings for the DMT collection. If before he was only known as a great landscape artist, his works of field flowers showed him in a whole new light as a fully rounded realist painter. Later his friend and Vilnius sales representative said that Alexander can paint many interesting subjects; he simply enjoys painting nature the most. Igor was born on June 14, 1959 in the Smolensk region of Russia, part of the USSR at the time. In 1976 he completed high school while at the same time attending Vilnius art school, completing it the same year. From 1976 to 1977 he worked in Opera and Ballet Theater as an art decorator. He enlisted in the Soviet Navy and served from 1977 to 1980 as a navy artist on various ships. He participated in the restoration of Kronshtad Cathedral as well as art exhibitions and forums within the Navy. Since 1980 and until 1991 he worked as portrait painter and restorer in various Soviet organizations. In 1987 he completed collegewith specialization as a photographer. After the collapse of the Soviet Union in 1991 Igor opened a business, at the same time working as a freelance artist mainly for the pleasure of painting. He worked extensively with photography and music. He decorated Lithuania’s most famous central hotel, “Gintaras”, the insurance company “Lindra”, tourist recreational centre in Moletei city, the café “Ruta” and a number of other organizations. Today Igor lives and works in Vilnius city as a professional artist. He has participated in many exhibitions within Lithuania and abroad, often traveling to exhibit his art in Poland. Working mainly with individual orders, Igor’s paintings are located in private collections all over the world. He is well known among European and Russian collectors, and a large number of his artworks are in Canada and the United States. As an artist Igor could be called one of the best precisionist painters in Lithuania today. That isn’t because his artworks are more detailed than paintings by Robert Zünd or Shishkin; Igor’s strength comes from his ability to balance that precision and detail just on the verge between sharpness and vagueness. His brushstrokes simultaneously contain detail and illusiveness, allowing Igor to merge realism and abstract within one artwork. It was precisely because of this talent that Igor Latyshev was selected to paint most of the flowers for this collection. He perfectly understood and was able to recreate on canvas that parallel feeling in each flower painting where reality had to be merged with the abstract to create a completely different perception of common nature. Igor’s talents go farther than distinctive art. As a photographer he is able to see lights, shadows, angles and perspectives. As a painter Igor uses colors to make images and feelings inside him come to life. Being a regular fisherman he is constantly in touch with the energy of nature, portraying it like no one else. Music enlightens his soul and allows him to make art full of melody and delight. Each artwork that Igor makes has its own identity and meaning. The greatest part of Igor’s art is that he never stays in one place; he constantly ventures into abstract painting, realism, photo realism, romanticism, cubism, or magic realism, covering a vast range of styles and images. To better understand how great artists made their masterpieces he reproduces their artworks to find the specific details hidden within their paintings. Constantly experimenting with new ideas, he is truly a well balanced artist. When approaching any artwork Igor does substantial research in order to fully understand the core of an image and only then develops it on canvas. Subjects which Igor uses for his art are vast. One of his favorite themes is portraits of animals and wild nature. Occasionally he enjoys setting off far into history while other times modern cubism or cityscape is the only thing on Igor’s mind. What ever artwork he makes it always attracts lots of attention. The canvas sizes that Igor chooses entirely depend on the composition of the painting. There are no standard sizes for him unless it is a special order; thus he creates large artworks more often than small, still maintaining that distinctive precision. Born on February 13, 1958 in Vilnius, Leonid completed Čiurlionis art school and worked as a decorator before he started painting in 1991. He has worked with graphic design, ceramics, metal engravings and incrustation, and from 1991 to 1993 had three personal exhibitions. From 1995 to 1996 he worked as a designer and restorer in New York. He is a member of the intellectual discussion club “Astra”. 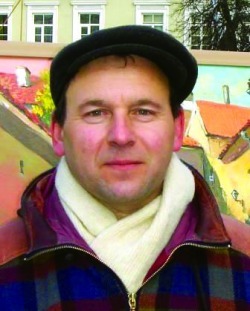 Today Leonid lives and works in Vilnius as a professional painter, designer and graphic specialist. He has worked extensively in developing Web pages, specifically for Lithuania’s well-known company “Penki kontinentai – The Five Continents”, including logotypes, trademarks and cover compositions. More than 30 of Leonid’s paintings are owned by well-known Lithuanian businessman S. Zillerman, but the majority of Leonid’s artworks continue to leave for Israel. Leonid’s paintings are extremely popular with the European and international community, especially among Jewish art collectors, so his art has traveled extensively all over the globe. “At the beginning of the 20th century approximately 40% of the Inhabitants [in Vilnius] were Jews, 31% Polish, 20% Russian…” Because of the high population of Jews in the city some consider Vilnius as the “3rd Jerusalem”. Through many historical events the Jewish population and especially art culture have remained strong. Without a doubt, Leonid Lindin is the most qualified artist to offer a true representation of Vilnius and Lithuania’s Jewish culture to the entire world. If one had to summarize the feelings and emotions stirred by Leonid’s paintings in two words, “amazing” and “incredible”, though essentially meaning the same thing, come to mind. After seeing his art there isn’t much more to say. Leonid shows the utmost precision in all of his artworks. At heart he is a true romantic, so even though he paints in a realist style his works are full of romance and fantasy. While his favorite paintings are marina seascapes, there are no limits to his imagination. If in real life he is a very modest man, in his art he ventures into far corners of distant galaxies, sails over oceans and seas, and goes into wild winter forest of the north, not to mention the female beauty that occasionally comes to life on his canvas. A true romantic, Leonid paints romance like no one else. Edward was born in 1959 in Nevinnomisk, in the Stavropol region of Russia (USSR). Today he lives, works and creates his art in the city of Vilnius as a freelance painter. 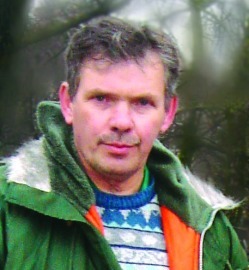 Edward began exhibiting his work in the 1980s. With the opening of the Russian Art gallery in Vilnius he became a regularly exhibited painter, having several personal exhibitions. Edward willingly demonstrates his works at personal and group exhibitions in other galleries as well. His artworks are to be found all over the world in private collections. The latest international exhibitions demonstrating his work took place in Czech Republic, 2001 and Kaliningrad City Museum (Russia), 2004. What formed Edward Anishchenkov as an artist? First of all, a burning desire to think about everlasting questions of life. His first artworks were dedicated to evangelic themes, and those who saw them would not forget the piercing dramatic images in front of them. If speaking of purely technical matters, then the greatest masters of the past and modern day are Edward Anishchenkov’s teachers and companions for life. What separates Edward from all other painters are his brushstrokes. Their sharpness and feeling of speed energizes an artwork so much that regardless of the image being depicted it becomes full of energy and movement. Even when a still life or calm images are portrayed Edward manages to create two parallel worlds in one painting. First, that central image – a sleeping dog peacefully laying on the ground or a walking bear slowly strolling through the forest – is what you see. Then a second world comes to life in the brush strokes of that painting. To me that world is like a jungle. If you look at it from a high mountain you see a calm, motionless green mass that never changes or moves. Then as you walk down and enter the jungle a chaotic richness of life comes down upon you: Birds try to out-sing each other, bugs of all kinds surround you where ever you go, wild animals are seen here and there following your every move, life under each rock and leaf that you move jumps in all directions. This ability to bond calmness and intensity as one is present in all Edward Anishchenkov’s artworks, making his paintings true masterpieces of Lithuanian culture. Born in the 60s Eugene is a Jewish Lithuanian artist who works and lives in Vilnius, where his art is extensively sold in the art center of the city through a number of agents. He rarely sells art himself, spending most of his time painting. Eugene occasionally participates in exhibitions in Vilnius and other regions of Lithuania. From his art one perceives that Eugene is a purely romantic artist with a real love for nature, especially oceans and seas. Marinas, lakes and waterfalls are his favorite to paint on canvas and he does that very well. Colors in his artworks are always vibrant and alive, creating a perfect image. Eugene’s talent is clearly seen when he easily makes a beautiful small-sized painting and with the same effortlessness paints a great, effective and just as detailed two-meter artwork. Eugene is able to perfectly capture the idea of a symbolic, romantic, yet realistic image and with his skillful perception make it come to life. Arunas was born in 1961 in Vilnius. In 1986 he entered the art faculty of the pedagogical institute of Shiauliai. In 1993 Arunas graduated from the Institute and participated in a number of exhibitions in Vilnius, Amsterdam and Holone (Israel). Many of his artworks are in private collections in Canada, the USA, Australia, France, Germany, Israel, Sweden and Australia. At present Arunas is represented by only one artwork in the entire collection, “Guardian of the City”, but this in no way prevents the viewer from seeing the real skills of this artist. Arunas is truly a master of fantasy art, creating paintings in his own very unique style. His art is way out of this world, caught somewhere in the subconsciousness of parallel dimensions. What Arunas is able to do with his art let us see astonishing hallucinations and dreams become a reality. Collectors should note that thanks to Arunas’ unique background textures, the paintings that he creates are impossible to duplicate – even by the artist himself. The general image might be made again but the artwork will always be easily distinctive. This makes each painting by Arunas Miliukas a one-of-a-kind creation. Gintas was born in 1968 in Lithuania’s largest costal city, Klaipeda. After finishing local art school he became a professional painter and currently lives and works as an artist in Klaipeda. Gintas’ art is well known in Lithuania and abroad. His paintings are frequently sold in Vilnius through a number of representatives, although most of his artworks circulate in Klaipeda where tourists and collectors take them home to all parts of the world. Gintas occasionally participates in exhibitions, mostly abroad. His latest international exhibition took place two years ago in St. Petersburg (Russia). Most of his art Gintas signs under his own name, although occasionally he paints under the pseudonyms “E. Narsis / Narsutis”. He is a yearly participant in Lithuania’s biggest national arts and crafts fair, “Kaziuko Muge”. A strong follower of romanticism, Gintas is an astonishing master of land and seascapes, able to create the most picture-perfect nature of dreams. His artworks leave the viewer full of the delightful emotions and relaxation that so many people seek. With a very precise manner of painting and cheerful bright colors Gintas takes us to the dreamy environment that can only be found in fairytales. Romantic landscapes are just a part of his many art styles. Gintas stunningly creates exquisite paintings of still life, flowers and classic realism. Almost all the artworks Gintas paints are in 60 cm x 90 cm format, although much larger artworks are not rare for him. His bright and uplifting artworks are perfect representations of the energetic artists of Lithuania’s Baltic Sea coast. Born in 1938 in the town of Zheleznovodsk, Eugene received his education in the USSR, graduating as an engineer from the polytechnic institute. Now retired, he lives and works as an artist in Eishishkes village, which is in the Shalchininkai region of Lithuania. He has participated in exhibitions across Lithuania and is especially popular in the art center of Vilnius, where most of his art is sold. Over the years Eugene’s paintings have traveled far beyond the Baltic region, reaching Japan, Australia, Russia, and North and South America, although at home in Lithuania he is just as popular. Eugene’s art can be found in government organizations such as Trakai Lithuania’s National Historical Museum, the most visited museum in the country, and the Embassy of the Russian Federation in Lithuania; his work is also in Lithuanian private companies and organizations such as Minolta Baltia, City News Service, OVB Allfinans and UAB Lanreta. Like many in Lithuania, Eugene in his spare time enjoys lake and stream fishing. In his art Eugene paints the Baltic nature that is so close to him. As a fisherman he sees many beautiful rivers and lakes among the landscapes of the Lithuanian countryside. And since the best time for fishing is late spring to early fall, when all nature is a lustrous green, the air is warm and all life is blooming, Eugene’s art captures that exact feeling of flourishing nature. The green colors of early summer forests always dominate most in his paintings, allowing viewers to relax their eyes when they are between the concrete walls of busy city life. Eugene paints his art in a realistic style with a touch of romantic impressionism, giving a balance of perception and imagination in one. Most of his artworks are done on standard 60cm by 90 cm canvases, although he occasionally experiments with all sizes, small and large. Born in February of 1965 in the village of Naumiestis, located in the Lithuanian district of Shilutes, Sigitas lives and works as a painter not far from the Baltic coast in the city of Plunge. Sigitas received a secondary education in the Lithuanian art school. He worked as an artist in Plunge’s BGAK organization and the Department of Culture. At present he works as a self-employed artist painting mainly with oil in styles of surrealism, impressionism, romanticism and abstract. His preferred subjects are landscapes, architecture, still life in surreal compositions, abstract and imaginative structures. In his spare time he enjoys theorizing and configuring architecture. In the past few years Sigitas has had more than 10 exhibitions within Lithuania and abroad organized by the Lithuanian Ministry of Culture – a result of the government’s cultural department naming him one of the most promising young artists in the country. In March 2008 his artworks were shown on the Lithuanian cultural TV program “Panorama”. Sigitas’ artworks have been exhibited all across Lithuania. Many of his paintings have left Lithuania for Russia, Western Europe, America and a number of other countries. Viktor was born on April 13, 1960 into a Russian-Polish family. Today he lives and works in Vilnius as an independent artist. He has never received formal artistic education, so everything he achieved in painting was self taught. Viktor is an authentic Lithuanian artist with his own unique perception of life. In art he is a romantic cityscape painter excelling in old Vilnius city views. Occasionally, for a change, Viktor paints beautiful flowers with realistic and abstract backgrounds. When painting Vilnius city Viktor uses interesting combinations of colors – his various cold shades of black and blue with warm yellow, brown and white colors produce the feeling of a crisp spring morning or the mystery of humid evenings in the lonely streets of Vilnius. 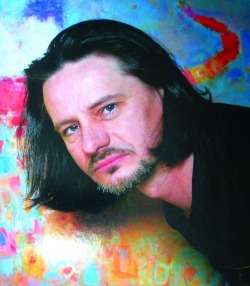 The ability to not only master but create his own unique painting style places Viktor among the most exotic ethnic artists of Lithuania. Kostas was born on December 12, 1953 in the region of Klaipeda, Lithuania. Even as a little boy he was attracted to the pictorial arts, perhaps because his father used to paint in his leisure time. Nevertheless he received his education in the Polytechnic Institute, not in the Academy of Arts. Originally painting was only an activity of his leisure time, but since 1990 it has become his living. Kostas learned the basics of arts in the art studio “Guboja" in Klaipeda. From 1977 on he took part in many art exhibitions, including many personal exhibitions in different cities of Lithuania. The most important among his personal exhibitions were the exhibitions at Klaipeda's Exhibition Palace in 1992 and at the Russian Art Gallery in Vilnius in 2006. He has been a member of the Lithuanian Folk Art Society since 1982 and of the Samogitian Artists Association since 2001. Since 2003 he has painted in Sweden every summer. In the summer of 2005 he also visited Denmark, where friends helped him organize his workshop and advertised him in the local newspaper. Kostas is one of the best oil painters in Klaipeda. Constantly developing and searching for something new, Kostas reflects thoughts and research in the art that he creates along the way. Inspired by impressionism, Kostas enjoys painting magic and fantasy art, landscapes, surreal life, dark art, architecture and marinas. Each of his paintings has their own personality with a deeper meaning, usually mixing reality with imagination. A historian, thinker and painter, through his art Kostas has enriched Lithuanian culture for the generations to come. Yonas was born in Lithuania in the 1930s, just before World War II. When the war ended Yonas went to work and at the same time studied arts in the Lithuanian art school. Today he lives and works as a painter in a small village near the town of Marijampole called Kazlu Ruda. Yonas’ artworks are known all over Lithuania, especially Vilnius city. One of his artworks hangs in Lithuania’s Presidential Place, with many other paintings in private collections all over Europe, from Portugal to Moscow. Yonas Chebelis often participates in exhibitions and fairs within Lithuania. His paintings are exhibited every year at Lithuania’s biggest national arts and crafts fair, “Kaziuko Muge”, organized in honor of St. Kazimir’s birthday. Yonas is a true enthusiast of nature, devoting his art almost entirely to it. Life in the small Lithuanian village brought him closer to the wilderness, opening up its secrets. Yonas perfectly captures them in his art to share with the rest of us. Son of Yonas Chebelis, Mindaugas was born in the 1970s in Lithuania, which at the time had been part of the Soviet Union for over twenty years. He lives and works as a painter in the same small village as his father, near the town of Marijampole called Kazlu Ruda. Occasionally he travels to work as an artist in Central Europe. Mindaugas is widely known for his art, especially in Vilnius, although his artworks appear in exhibitions all over Lithuania. His paintings are displayed each year at Lithuania’s biggest national arts and crafts fair, “Kaziuko Muge”, sometimes separately, sometimes together with his father’s art. As a freelance artist working all over Europe, Mindaugas’ paintings have found homes in many European and international collections. Art is clearly a family tradition in Chebelis’ home. Mindaugas followed his father’s footsteps to become an artist. He has completed Lithuanian art school, naturally developing his own distinctive style in painting. From viewing his art one comprehends that Mindaugas loves everything natural and wild. His landscapes portray the true Lithuanian countryside in calm, motionless tranquility. As a religious man Mindaugas occasionally enjoys painting biblical events and portraits that are especially popular in Poland, Italy and Latin America. Born in 1962 in the Soviet Union on the territory of Belarus, in the 1980s he moved to Lithuania, land of his ancestors, settled in Vilnius city and went to Vilnius Art School. After completion he decided to dedicate himself to art. “…Although in life I had tough jobs from being a construction worker to a mover I always returned to painting… God gave me this talent so art chose me, I believe it is my destiny in life…” Modesty, kindness and an enormous belief in God characterize Yonas Augulis, a person who had a difficult life where nothing was free and everything had to be gained by hard work. Yonas is a very religious man, living a true, simple Christian life in Vilnius; he makes his living entirely from art. Part of the money that Yonas earns he donates to his Christian religious group. He faithfully obeys all commandments and as a preacher propagates his beliefs to everyone who is willing to listen. When talking to Yonas you understand that this simple man has a very high intellect. Always kind and thoughtful, he mostly speaks of religion and its role in our lives. From his words one understands that his faith is not blind; he knows the Bible and other religious teachings from A to Z and can answer any question whatsoever. When asked what he prefers to paint Yonas said “…Usually I have to paint what sells best, but what I actually like is get away from it all and paint from real nature.”When Yonas paints he does that with no preparation “…I paint right away with oil, no pencil sketches or drawings on paper. I just start with brush and oil and let the artwork come to life on its own.” Depending on the artwork, Yonas is accustomed to oil and acrylic techniques.